Last week we found out that LeEco and Coolpad are working together on developing a new top of the line smartphone – which makes sense since LeEco is now Coolpad’s largest shareholder. That leak showed us an image of the handset’s back, gave us most of its specs, but failed to tell us one essential detail: what it will be called. Well, today LeEco and Coolpad have outed the first teaser for the device, and it brings us just that. 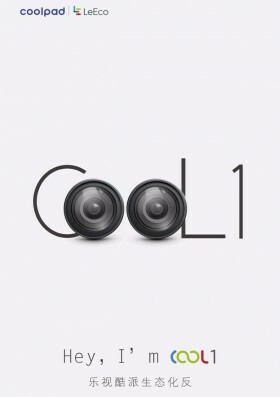 It turns out that the two companies have settled on Cool1 as the phone’s name (it’s anyone’s guess why they passed on LeCool). Furthermore, the teaser (seen to the left) also confirms that the handset will sport a dual camera arrangement on its back. The Cool1 may become official next week, on August 10, according to unconfirmed reports from China. It will have a 5.5-inch QHD touchscreen, the Snapdragon 820 chipset at the helm, 4GB of RAM, 64GB of storage, a fingerprint scanner on the back, and a 3,500 mAh battery. It will run Android 6.0 Marshmallow, apparently with both LeEco’s EUI and Coolpad’s CoolUI on top – and you get to choose which custom interface you prefer. No information about the Cool1’s price has been leaked up to this point.